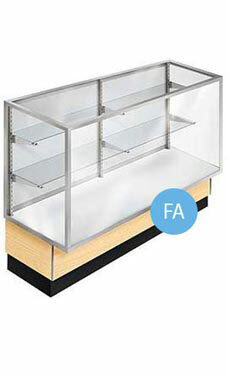 Store Supply Warehouse has a wide selection of full vision glass front display cases. This particular case measures 70" in length, and is framed at around all edges with metal. The metal frame complements the maple wood base, creating a modern classic that will add years of elegance to your showroom floor. With a number of features, including a durable melamine laminate maple finish, and a tempered glass top, front and sides, the display case will give your customers a clear visual of the merchandise they are purchasing. Additionally, each display showcase features include two rows of adjustable 1/4" split glass shelves 8" and 10" depth, steel interior standards and shelf brackets. The metal framed showcase contains brushed aluminum hardware. Optional lock and light kit available and sold separately. Crating for secure shipping is included in the price of the case. Ships fully assembled 38"H x 18"D x 70"L. Available for immediate shipment.